What kind of role will Russia play in the region after NATO troops have left, and to what extent does the Soviet invasion of the 1980s still shape local attitudes? True to the 'X factor' of Afghanistan's nebulous, twisting history, it took a relic of the Soviet fishing industry to bring the Western war machine to a standstill. 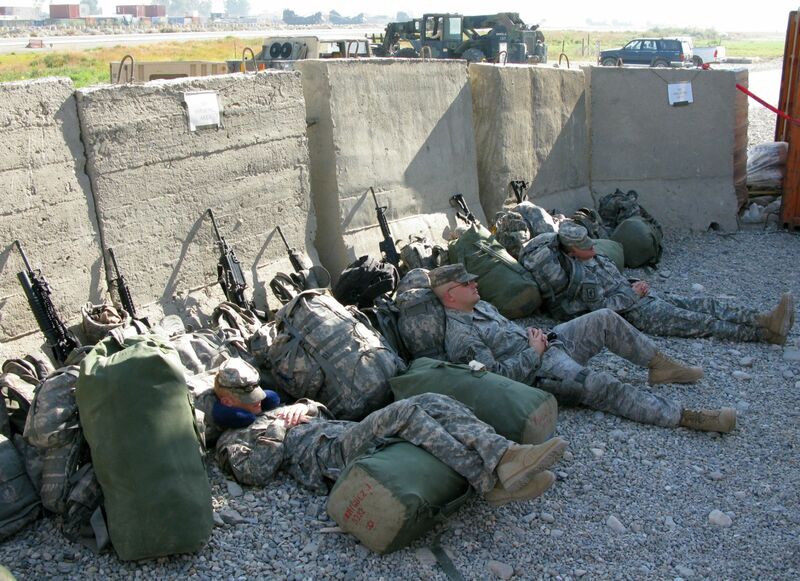 As international forces arrived to fight the War on Terror after September 11, 2001, the main road at Bagram Airfield north of Kabul had to be closed so engineers could neutralize a mine that U.S. soldiers had found poking from the earth. Only the 'mine' proved to be nothing more than an unopened tin of tuna fish left by Soviet troops two decades earlier. 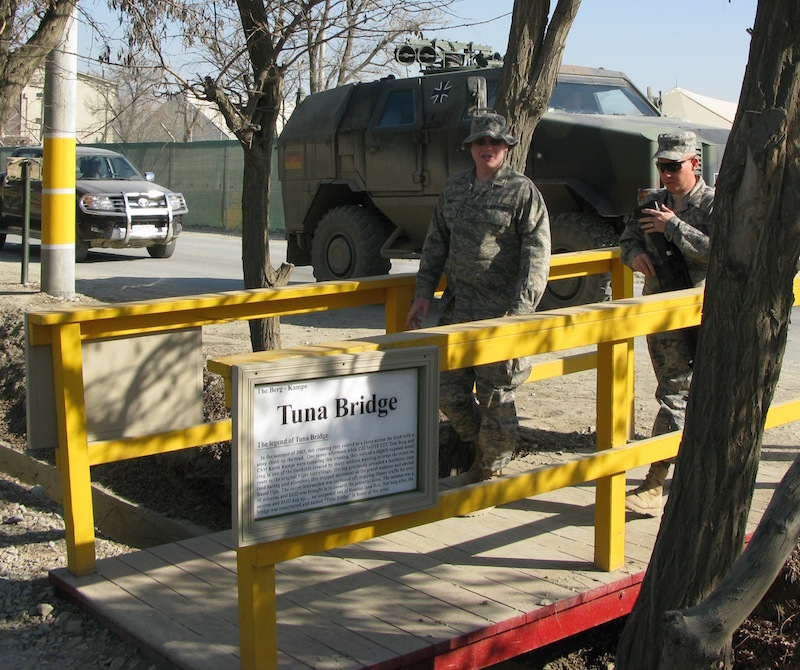 A small 'Tuna Bridge' for pedestrians was later built at the spot. Visitors to this landlocked Islamic country invariably get a sense of the past repeating itself. It may be the sight of hundreds of wrecked Soviet armored vehicles that litter the landscape beside debris of the current conflict, or communities tormented anew by the common denominators of war, drought and famine. Or just fleeting, incongruous echoes of times gone by. 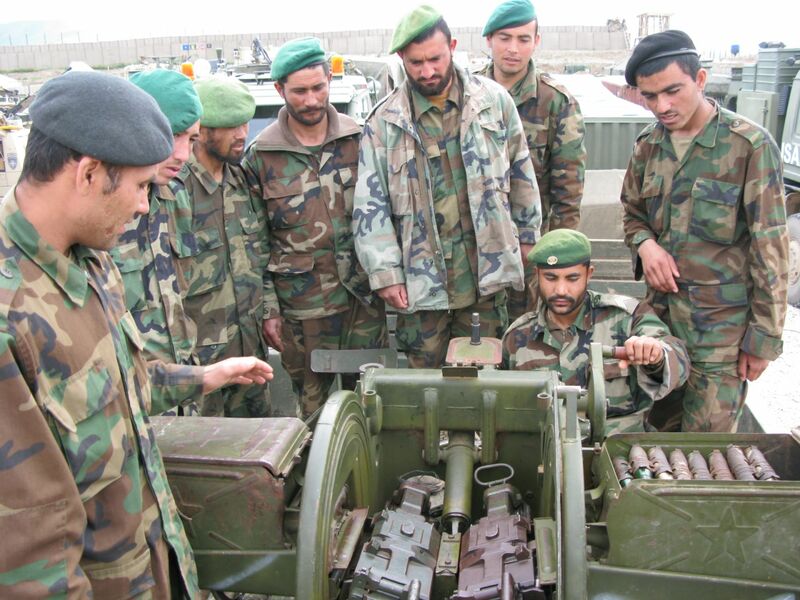 In 2008, New Zealand troops patrolling in the central province of Bamiyan came across a rusting Soviet anti-aircraft gun on a remote hilltop. On the wall of the crew's derelict shelter below, a recent hand had scratched in Cyrillic the words Russkie vernulis – "the Russians have returned." Left: Chassis of a Soviet ZU-23-2 anti-aircraft gun on a hilltop in the central province of Bamiyan. Top right: 'Russkie vernulis' (the Russians have returned) scratched on the wall of the gun's abandoned crew quarters. Bottom right: Soviet wrecks from the 1980s lined up by the roadside in the capital of Bamiyan Province. In many respects, they have. Today, as the United States and other countries withdraw combat troops from the International Security Assistance Force (ISAF) and wind down their Afghanistan involvement after 13 years, Russia is moving the other way. No military forces are involved this time, apart from trainers for Afghan helicopter crews: Moscow's latest efforts in Afghanistan consist of economic muscle, donations of vehicles and equipment to Kabul's security forces, humanitarian aid and a major drive to rebuild Soviet infrastructure destroyed in the civil war of the early 1990s. Russia also canceled more than $11 billion of Afghanistan's sovereign debt in the decade following the Taliban regime's ouster in 2001. Ask the Russian Embassy in Kabul, and the assistance is all due to "commitment to develop diverse cooperation…mutual interests…experiencing friendly bilateral ties throughout history." But specific reasons run deeper than goodwill or maybe even a sense of 'owing Afghanistan' after the misery caused by the Soviet invasion and the 10-year war that followed, in which more than a million Afghans died, as well as 15,000 Soviet troops. To a large extent this is about regional stability, containing militant Islam and keeping Islamist fighters from pushing into Central Asia and towards Russia's underbelly if the NATO effort fails and the Afghan government collapses. 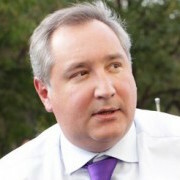 "First they will hit Tajikistan, then they will try to break into Uzbekistan," Deputy Prime Minister Dmitry Rogozin said in 2009 while he was Russia's ambassador to NATO in Brussels. "If things turn out badly, in about 10 years our lads will have to fight well-armed and well-organized Islamists somewhere in Kazakhstan." Then there are the tons of Afghan heroin and opium moving into Russia and Europe via the ex-Soviet Central Asian republics. Record drug production last year in Afghanistan only underscored the danger. "Russia maintains its long-standing interest in stopping the flow of drugs from Afghanistan, which causes serious social problems across the former Soviet Union," said Graeme Smith, a senior analyst with the International Crisis Group (ICG) think tank, who worked in Russia and for eight years in Afghanistan. Despite current tensions over Ukraine, the drug war is generally "an important piece of common ground that Russia shares with the United States and Europe," he added. But there is heavy Russian scepticism that the Western-led mission in Afghanistan failed to deal with the narcotics threat that mushroomed after the Taliban regime was toppled, and that Russia must now step up its own activities to contain it. "Narcotics production increased 44 times in the 12 years that ISAF has been present in Afghanistan"
Russia had already trained 500 Afghan counter-narcotics specialists and was ready to train twice as many, Naryshkin said. 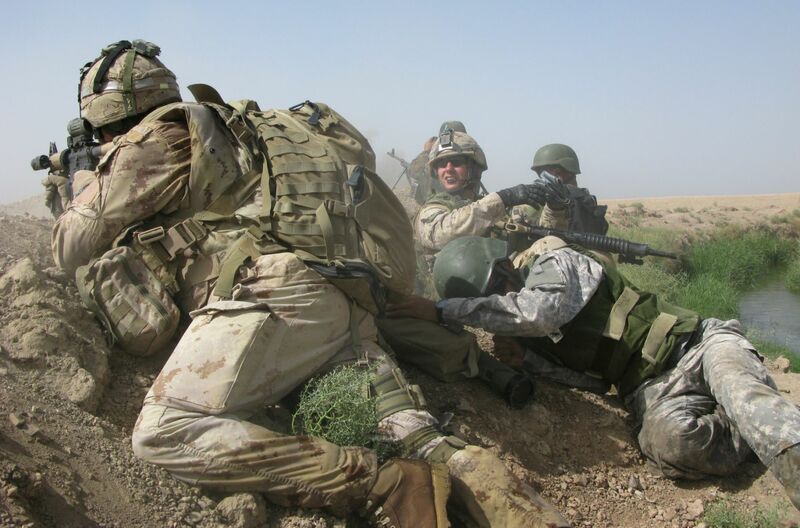 In June, the head of the Federal Service for Control over Circulation of Drugs, Viktor Ivanov, also announced plans to fund and build a base for Afghan commandos near areas of high drug production in Kunduz Province, along the border with Tajikistan. In 2010, Ivanov's agency even mounted a joint operation with U.S. and Afghan security agencies. Russian helicopter gunships destroyed four underground heroin processing laboratories in Nangarhar province. But although the operation was deemed a success - seizures included more than 900 kilos (around 2,000 lbs) of heroin, equivalent to some 200 million doses - this was the only raid of its kind. Hamid Karzai, Afghanistan's president at the time, was reportedly angered that he was not consulted and forbade further joint operations. Some observers still feel, however, that while the narcotics threat is real, it is also just another piece of the story playing out in the wider region. "What is it that we have in Afghanistan that everyone seems to want, and why does everything get destroyed all the time?" Money spent on counter-narcotics strengthens a series of agencies and weak points in government structures in Afghanistan, as well as neighboring states. "[The drug menace] may be a way to justify the investment of resources, as much counter-terrorism funding is in part a way to provide assistance to weak Central Asian regimes," says Dmitry Gorenburg, senior research scientist at Harvard University's Davis Center for Russian and Eurasian Studies. Meanwhile, ordinary Afghans are far removed from the geopolitical manoeuvring on high. For most, the key questions are much simpler. "What is it that we have in Afghanistan that everyone seems to want, and why does everything get destroyed all the time?" asked Lt. Kadyr, a former Afghan Army cadet who trained in Russia in the 1980s and later headed an Afghan Border Police anti-smuggling unit on the border with Uzbekistan. His country's location on the East-West trade routes, wedged between former empires, is a big part of the explanation. The 'Great Game' for influence and strategic advantage that Russia played against the British in and around Afghanistan in the 19th century received a new lease of life in the post-9/11 world. To ensure the defeat of the Taliban, Russia was swift in providing local intelligence to the U.S. as it prepared to pursue Al-Qaeda in Afghanistan after the strikes on New York and the Pentagon. 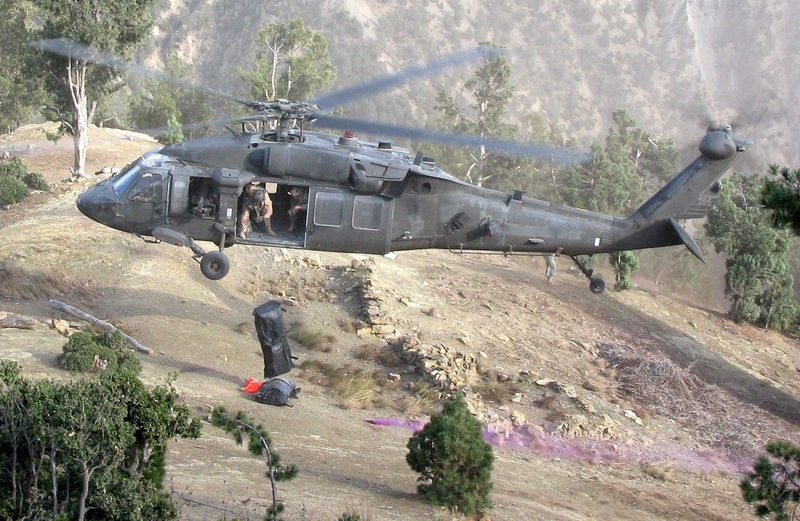 Then, from 2008, the Kremlin acquired new clout in developments in the region as NATO's Khyber Pass supply route in Pakistan was jeopardized by insurgent attacks and U.S. disputes with the government in Islamabad. Accordingly, Russia's ability to offer alternative routes through its territory and that of its Central Asian allies gave useful leverage on issues like a proposed U.S. missile defense shield in Europe and NATO membership for Ukraine and Georgia. Moscow said it was coincidental that Kyrgyzstan received a $2 billion Russian aid package and then announced that it would end its unilateral transits of U.S. personnel and equipment to Afghanistan. As the Pentagon ramped up troop numbers in the war, it had to explore the costly back-up Russian route for non-lethal cargo. A stray dog takes a nap beneath battle damage to an Afghan police post in Paktia Province. But logistics are one thing, tactics quite another. Throughout the troubled Western military campaign after 2001, Moscow's ambassador to Afghanistan, Zamir Kabulov, said NATO was making the same mistakes as the Soviets had. Speaking to the NATO-Russia Council in Brussels in 2008, Kabulov urged the alliance to radically alter its tactics and strategy. Negligence of the Afghans' national, religious and cultural traditions was a grave error, the diplomat said. "If things carry on like this, it will be a complete defeat, military and political, and when this will happen is only a question of time," he warned. Six years later, much has changed. 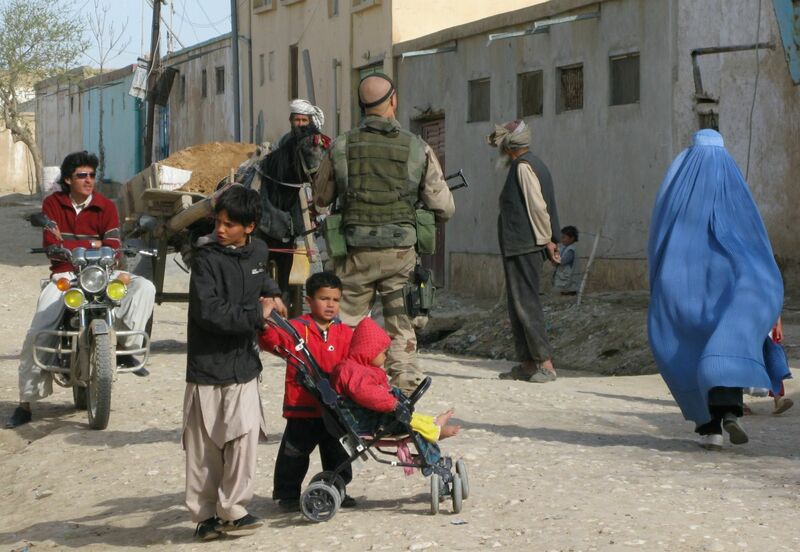 NATO forces will end their combat mission by December and leave, while the Taliban are still growing in strength. Much of the population is disillusioned and alienated by the continuing violence and deepening corruption, and the Afghan government is wracked by instability. Meanwhile, Russia and NATO members are now at loggerheads over the spiralling conflict in Ukraine. But in another odd twist, realities in Afghanistan have helped temper sanctions sought against Russian arms exporter Rosoboronexport by the U.S. Congress and Senate over Ukraine. 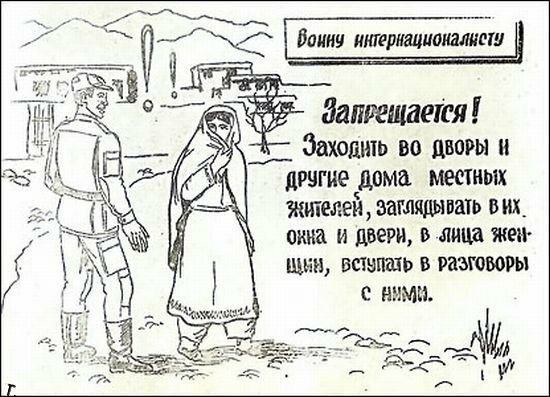 Different eras, the same challenges: A 1987 Soviet military handbook instructs personnel in Afghanistan: "It is forbidden to enter the yards and houses of local inhabitants, look through their windows and doors, or look women in the face and start a conversation with them." This would have "catastrophic" effects in Afghanistan, the top U.S. commander there warned, as it could halt the supply to Afghan security forces of 88 U.S.-bought Russian Mi-17 transport helicopters. Thirty of these are due to go to Afghan Special Forces for counter-terrorism and counter-narcotics operations. Marine General Joseph Dunsford said suspending the deliveries would also endanger the lives of 9,800 U.S. troops due to remain in the country through 2015 before a complete withdrawal by the end of 2016. "Without the operational reach of the Mi-17, the Afghan forces will not be successful in providing security and stability in Afghanistan and will not be an effective counter-terrorism partner," Dunsford told U.S. lawmakers in July. However, the deal seems to have been fulfilled now. Rossiyskaya Gazeta reported in late October that Russia will complete its supply of Mi-17 helicopters to U.S. forces in Afghanistan by the end of the month. On Oct. 29, the last three helicopters should start shipping to Kabul, pushing the total number of the craft purchased by U.S. from Russia to 63 (but not 88, after all). Given the likely consequences of an implosion in Afghanistan, Russia used to be enthusiastic about supporting NATO operations there. But the tone hardened as the international effort wound down. In June last year, Foreign Minister Sergei Lavrov criticized the U.S. and its partners for hastening their departure at the expense of the combat readiness of Afghan forces. 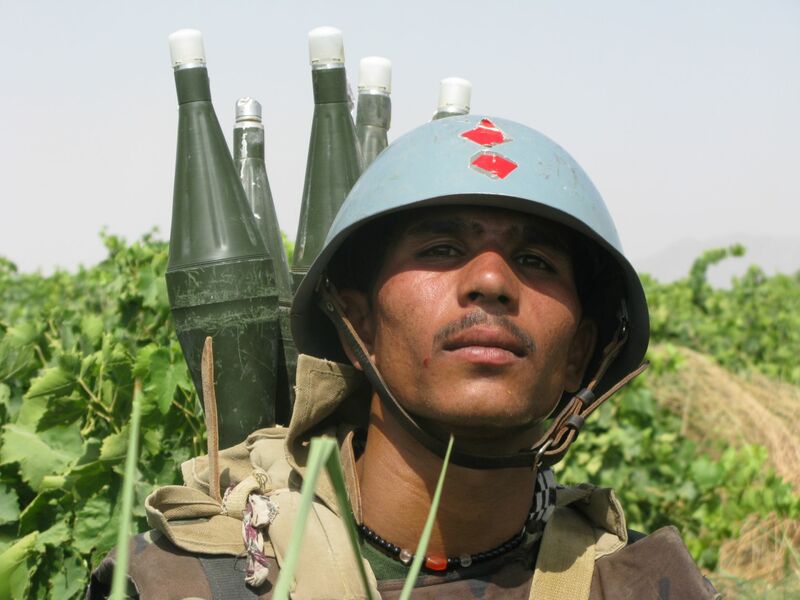 A 17-year-old ANA soldier poses with a PKM machine-gun and ammunition belts draped around his head for comic effect. Bolstering these was now essential to "avoid a collapse in the country as a result of the pullout of ISAF troops," Lavrov told the Kuwait News Agency. "A danger exists that [the entire region] will destabilize." Ethnic Uzbeks and Tajiks from extremist and terrorist groups based in northern Afghanistan were already "making plans to infiltrate the territories of Central Asian countries," Lavrov said. Part of Russia's support has been very direct, like the 20,000 Kalashnikov assault rifles it gave to Kabul against the Taliban-led insurgency. 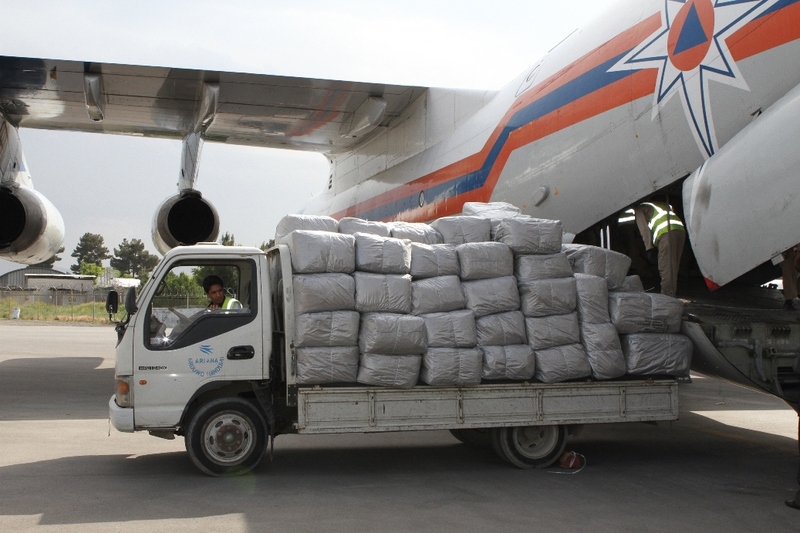 Emergency aid deliveries also helped tackle the effects of natural disasters, like the mudslides in May that killed more than 2,000 people in the northern Badakhshan province bordering Tajikistan. And Russian renewal of old infrastructure is, for some people at least, a visible and reassuring sign that not everyone is now heading for the door in Afghanistan. Where the ruins of the Soviet Embassy were full of displaced families, sickness and squalor in 2001, there now stands a renovated Russian diplomatic complex, huge, fortress-like and built for long service. Elsewhere in the capital, Afghan contractors are restoring the first of around 140 Soviet-era projects that Russia wants to rebuild, according to the embassy. The Kabul Housebuilding Factory, the country's largest manufacturing facility, received the first fruits last fall in the form of $25 million in new equipment. Overall, Russia is spending $40 million on the site, which upon completion "will allow [us] to provide Afghans with affordable houses of a good quality," embassy spokesperson Yana Mikhailova said. Another key project in the city is the Russian Cultural Center, due for completion in December at a reported cost of $20 million. Originally built in 1982, the former Soviet House of Culture and Science was almost destroyed in the civil war of the early 90s, its ruins later occupied by drug addicts. The new complex will include auditoriums, a library and concert-hall, a multi-media center and sports and leisure facilities. Around 500 Afghans are working on the project. But while many people welcome the reappearance of Russian knowhow and money, others are wary. Memories of the war are still vivid for many people, including some who were children in the 1980s. "I don't think the Russians should return," says Abdul Karim, 32, from Balkh Province. "They are at the root of all the suffering we have today, and we have a saying in Afghanistan: 'Someone you tried out once should not get a second chance'." "Urban and rural Afghans tend to remember the Soviet period differently," said Graeme Smith of the International Crisis Group. "In the cities, Afghans can often point to positive legacies of the Soviet occupation: a grain silo, an apartment block, a ministry building. "It's the opposite situation in rural areas, where villagers will point to former battlefields and describe the terrible destruction of the war in the 1980s." But the wounds of the past seem to be healing. Last year, a group of Russian veterans even came to Afghanistan to play soccer matches against locals, including a few former mujahedin fighters. Inevitably, as much was thrashed out off the field as on it. Soviet forces "assaulted our villages, killed our people and bombed our houses … Nobody was held accountable," said ex-mujahedin fighter Mohammad Azim as he watched a game in the northern city of Mazar-e-Sharif. "Yes, they fought in Afghanistan, but they also built fertilizer production plants, universities, dams and other infrastructure," countered 47-year-old Habibullah, one of the generation of Afghans who travelled to the Soviet Union to study in the 1980s. 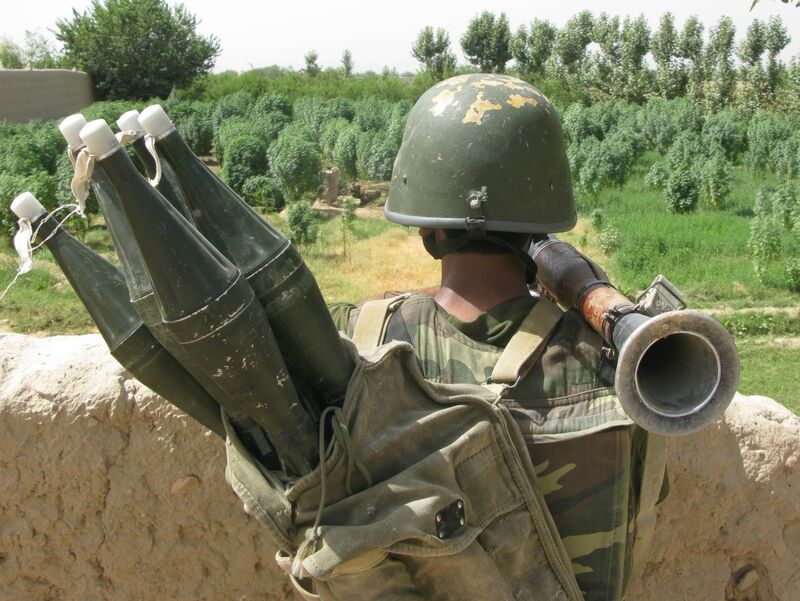 "These are still useable and Afghans are still using them." Nor are infrastructure objects the only things built in that period which are still serviceable. 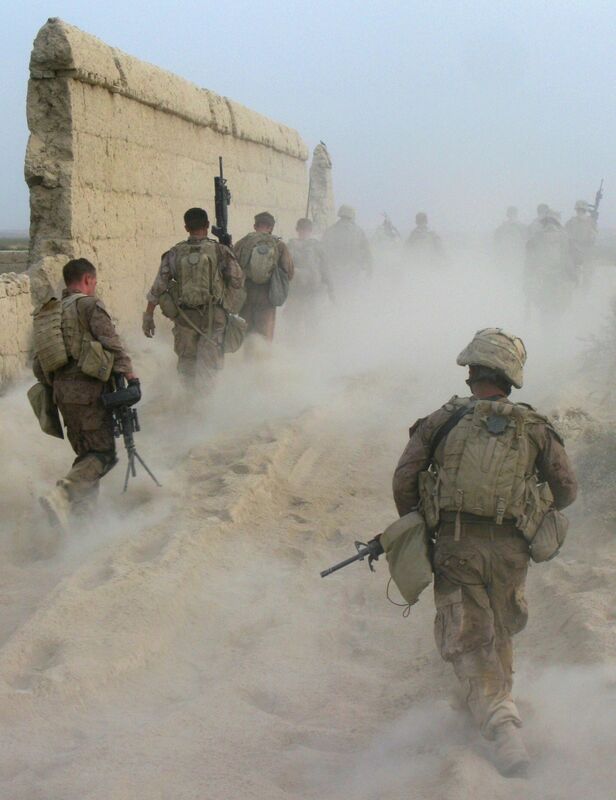 "[Fighting] positions built in this spot almost 30 years ago were still being used on a bi-weekly basis against our own troops and Afghan Army convoys passing through the area," recalled Gabe Stultz, a former U.S. Army lieutenant who in 2009 commanded an infantry platoon in the eastern province of Khost. Together with the rusting wrecks of knocked-out Soviet vehicles, the fighting positions used against the Soviets "reminded me that these guys have been doing this for a long, long time," he said. In Khost, much of the resistance was again led by Jalaluddin Haqqani, a key commander against the Soviets in the 1980s, together with his son Sirajuddin. This former ally of the U.S. served in the Taliban government before the 9/11 attacks. He also commanded Taliban forces when the U.S.-led Operation Enduring Freedom began in Afghanistan in October 2001. 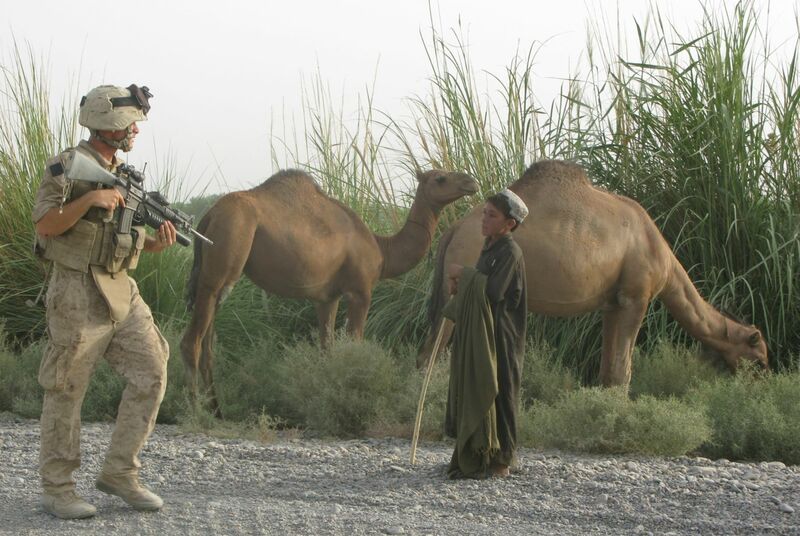 American hopes of getting him to fight his former Taliban brethren quickly vanished. During a trip to Pakistan in 2001, Haqqani was quoted as saying: "We will retreat to the mountains and begin a long guerrilla war [against the Americans] to reclaim our pure land from infidels and free our country like we did against the Soviets." "If you want to learn about a strange country, say experienced travelers, disappear into it. But in Afghanistan we couldn't even manage to do that." Overall, international forces faced many of the same problems - and fighters - encountered by the Soviet troops, including how to get close to ordinary Afghans without becoming too vulnerable. 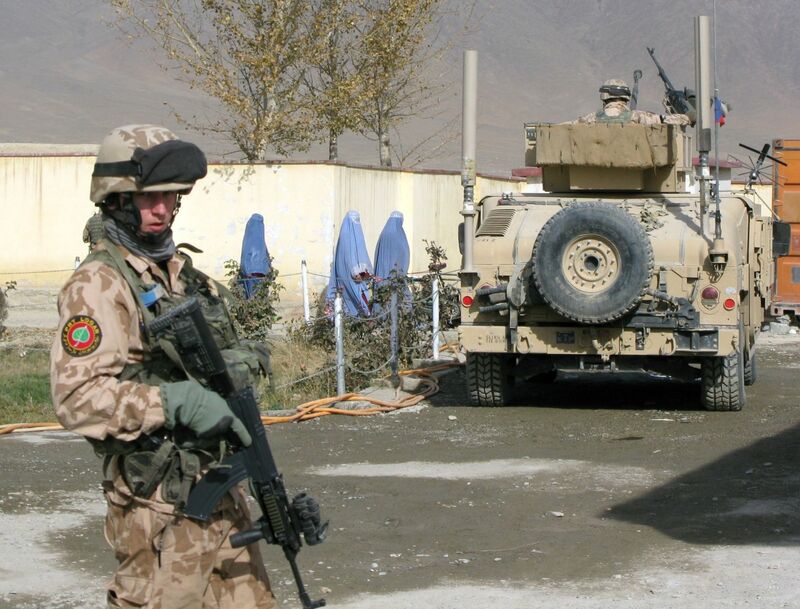 "To protect the lives of people we wrap them in a 20-ton armored vehicle, which will protect you from a blast but prevent you from talking directly to people," a Canadian captain in Kandahar said before his country ended its combat operations in 2010. "And the helmet, flak jacket, ballistic eyewear, mouthpiece and wire running to our ear, all the kit makes us look like starship troopers, worlds apart from the people we are talking to. How do you be intimate enough without being too intimate?" In his 1990 book The Hidden War, the late former Soviet soldier and journalist Artyom Borovik wrote: "If you want to learn about a strange country, say experienced travelers, disappear into it. But in Afghanistan we couldn't even manage to do that. "During the nine years of war we were constantly separated from the country by eight centimeters of bullet-proof glass through which we stared in fear from inside our armored carriers." Russian helicopter pilot Sergei served in Afghanistan as a military pilot in the mid-1980s and returned two decades later to fly humanitarian aid for the United Nations. "When I left in 1987 I wanted to come back some day and see the place again, see what had become of it," said Sergei. "In Mazar-e-Sharif people reacted excellently to me, without regard to what happened in the past - they hear Russian and even invite you to their homes for dinner," he said. But if the cities were civilized and hospitable, the countryside was as barren as he remembered. "Nothing has changed here. It's the same mountains, the same heat, the same dust. And they're still fighting." Meanwhile, many signs and echoes of the former Soviet Union have resurfaced in Afghanistan over the past decade, often in unexpected forms. Georgian and Azeri troops served among the ISAF forces, as did personnel from seven other ex-Soviet republics. 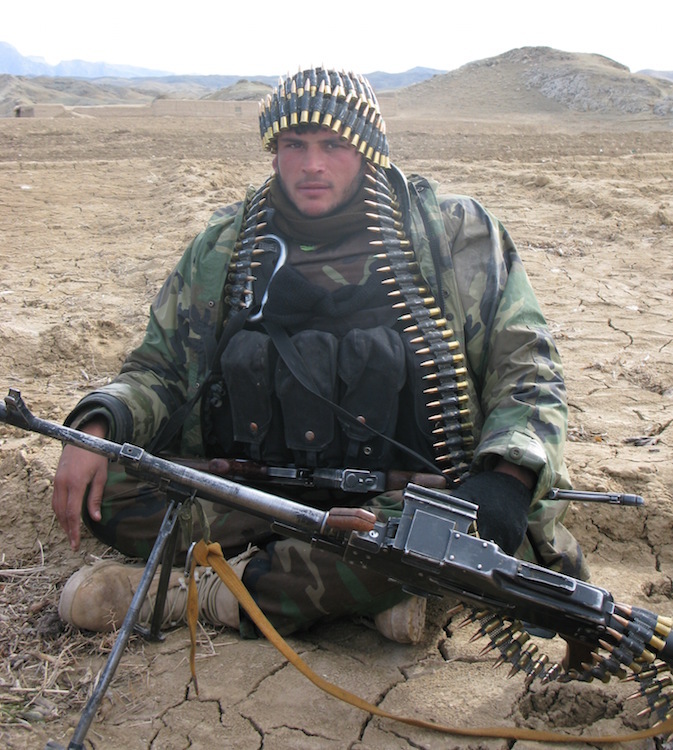 On the opposing side, Uzbeks, Tajiks and Chechens have fought for the Taliban, usually armed with Soviet/Russian weapons that the Afghan government forces also still use. On larger ISAF bases, the barber shops, massage salons and stores are staffed mainly by Russian-speaking Kyrgyz citizens recruited in Bishkek. And by the store exits there is usually a table covered with Soviet military paraphernalia and souvenirs with Lenin's image, badges, old ruble banknotes and ushanka fur hats. 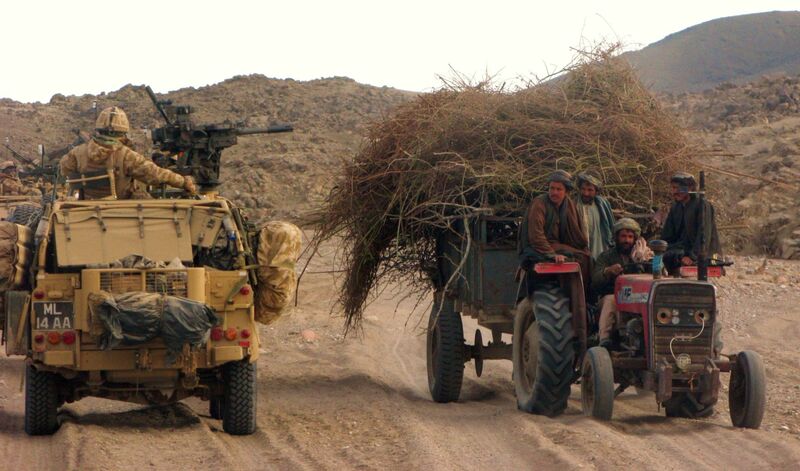 Some of those fighting for ISAF came here before, in another time and what now seems another life. For one troubled Red Army soldier, it took a return visit to Afghanistan to reconcile himself with past horrors. "After serving there during the Soviet campaigns, the nightmares remained for years," recalled the former commander of the Estonian contingent in Helmand Province, who fought as a Soviet paratrooper in Kandahar in 1986-87 and came back with NATO two decades later. "After being there again, things have kind of clicked into place in a good sense. Now, some dreams haunt, but in general, my soul is at peace," wrote the officer. The legacy of the 1979-89 war also haunts many others in the former Soviet republics, including families of Soviet soldiers still unaccounted for. Russia maintains its search mission for 264 military personnel. Most are presumed dead, but a handful may have survived and assimilated in Afghanistan since being taken prisoner or deserting. Others felt that Afghanistan was home already, having spent most of their adult lives here, grown beards and browned in the sun, learned Dari or Pashto (Afghanistan's two official languages) and raised families. But the task of tracing others, alive or dead, continues regardless. "Not one soldier who followed the orders of his state should be forgotten," says Alexander Lavrentiev, the deputy head of the Local War Veterans Committee. Having visited Afghanistan 19 times since he joined the organization in 2009, Lavrentiev, 61, was also struck by the welcome he received across the country. "One of the greatest surprises when I started this work in Afghanistan was the invariably friendly attitudes of Afghans from all walks of life towards former Soviets, including people who had fought and lost loved ones. We always shared the view that war is a tragedy for both sides. Whether it was an Afghan or Soviet mother, a son had died"
Apart from the U.S. troops that will stay until late 2016, the foreign contingents will all end their combat mission in Afghanistan by this December. 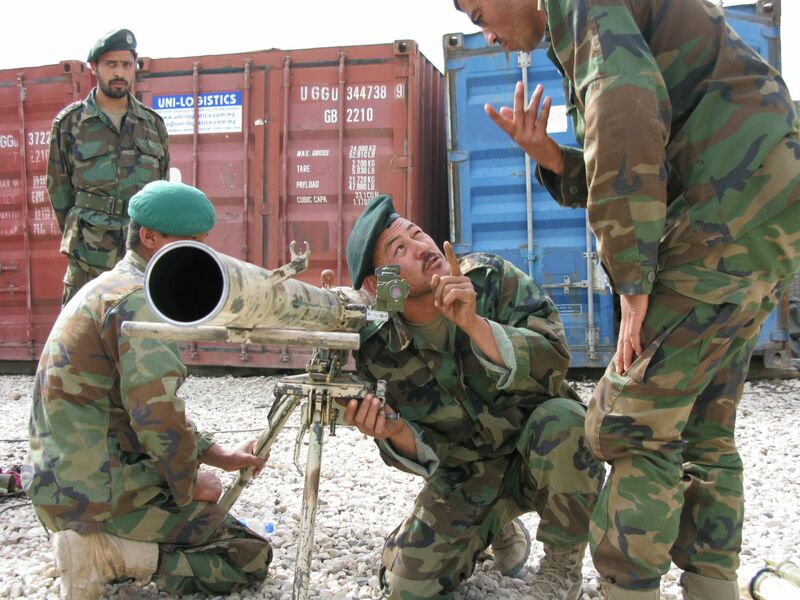 Many will leave trainers to support the nascent Afghan security forces, and their taxpayers will shoulder most the annual $4 billion bill of maintaining the Afghan forces, which currently number more than 300,000 personnel. But while leaders like Britain's Tony Blair had once assured that their countries would stay for "a generation" to rebuild Afghanistan, the withdrawal does not surprise most Afghans. History has all too often shown that nobody stays for long. For many, the usefulness of any foreign army is measured only in terms of how much material assistance they can get from it. A U.S. Special Forces operative who served in the western province of Herat was amazed to hear locals saying they preferred the Russians because they gave out more rice and basic products. "I said, 'but didn't they kill you though', and they said yes, but only if you opposed them. They told me they expected the Americans to leave before long and then someone else would come, like the Russians again, or maybe the British," he said, struggling to comprehend this casual lumping together in the same pile of all foreigners, Russians included. "It's almost as if this country needs to be invaded by someone, that it can't sustain itself otherwise." With the Western bonanza of aid and contracts now over and Moscow eager to step up, many Afghans, including former president Karzai, fondly recall the material and financial support that came with the Soviets. "The Soviet money went to the right place," Karzai said in a March interview with The Washington Post, a month before 2014 presidential elections to install his successor. 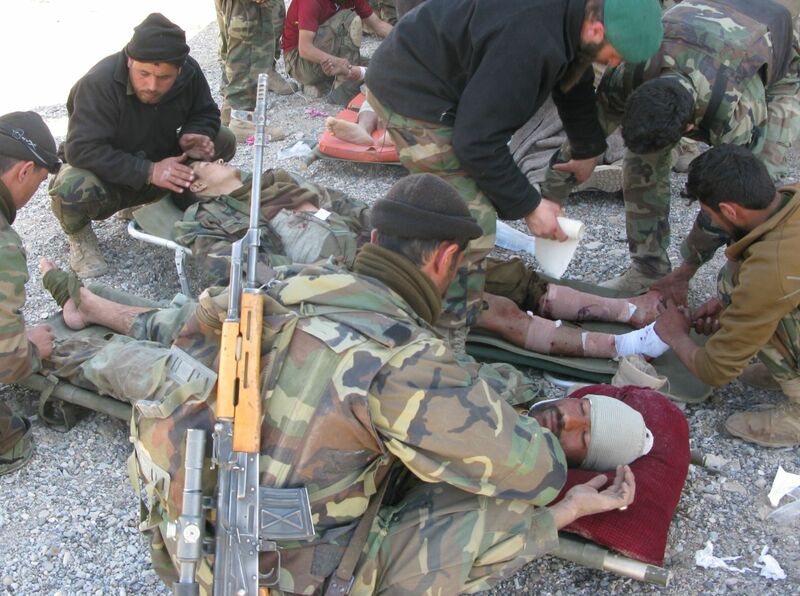 "They were efficient in spending their money and doing it through the Afghan government." It's also worth noting Karzai's swift acknowledgement of Russia's annexation of Crimea that month, while most of the world was condemning it. This coincided with the deterioration of his relations with President Barack Obama and the United States. Karzai's parting message to the U.S. leadership was one of "extreme anger", he said in the interview, mainly over the thousands of Afghan civilian casualties caused by U.S. and international operations. Although the prospect of more Russian spending and support may rose-tint perceptions of the Soviet era, Lavrentiev of the veterans' committee also says the hundreds of conversations he held across the country told him something more. The Soviets regarded the Afghans as equals and talked to them like people, without insulting their honor, his interlocutors often said. "Also, they genuinely wanted to make the lives of Afghans better, they educated children and adults, gave medical care, built enterprises to carry out real work, not just for the generation – or theft – of revenues," he added, referring to myriad corruption scandals involving vast sums of foreign funds since 2001. "The presence of the (Western-led) coalition in Afghanistan over many years provided plenty of material for comparisons in this respect," said Lavrentiev. "And the vast majority of Afghans drew their conclusions long ago." Apart from safe assumptions that security will continue to deteriorate as international forces leave, the analysts and crystal ball gazers struggle to predict developments with any certainty. This includes the chaos that has ensued over the election of Karzai's successor, which was still not settled in early September. In one of his first foreign policy moves, Afghanistan's new president, Ashraf Ghani, signed the stalled bilateral security agreement with the United States to allow a reduced US troop presence through 2016. But having worked for five years in Russia with the World Bank, Ghani is sure to welcome further Russian support for his country too. But, as has been the case for centuries, it will be realpolitik that will shape the alliances of the day, including with Russia and the U.S., say observers. "There is a real possibility that Russia could emerge as a long-term ally of Afghanistan," said Smith, also noting the high level of Russian security assistance to the neighboring Central Asian states. "Their security challenges may increase if Afghanistan becomes more permissive for [terrorist] groups such as the Islamic Movement of Uzbekistan (IMU). "That [also] gives Russia and the U.S. a shared interest in Afghanistan's stability." "I think there is certainly ground for cooperation and plenty of common interests," adds Harvard's Gorenburg, speaking about the possibility of Afghanistan helping to bridge rifts with the United States. "However, I think that tensions in the overall relationship [with the U.S.] will prevent such cooperation from going far." Russia may choose to go it alone again in its state-building assistance to Afghanistan, drawing on the lessons of the West's mistakes and those that the Soviet Union also paid a high price to learn. "I don't think there is a sense of debt [to the Afghans]," Gorenburg concluded. But, "There may be a sense of knowing something about the country, and therefore being more capable of having an impact when compared to the U.S. or other Western states." But even hard-won Russian knowhow may not be enough to forge anything truly lasting in this country of perennial upheaval and transition. While appreciative of the material windfalls of foreign interventions, Afghans still like to cite an old proverb: "You can't buy an Afghan, you can only rent him." The wreck of a knocked-out Soviet T-34-85 tank still marks the landscape in the north-eastern province of Kunar. "They are opportunists, they grow up like that to survive," a Danish Army captain trained in Pashtu and tribal relations said in Helmand. "You know they are cooperating because it's viable, but if something better comes along they can just switch." 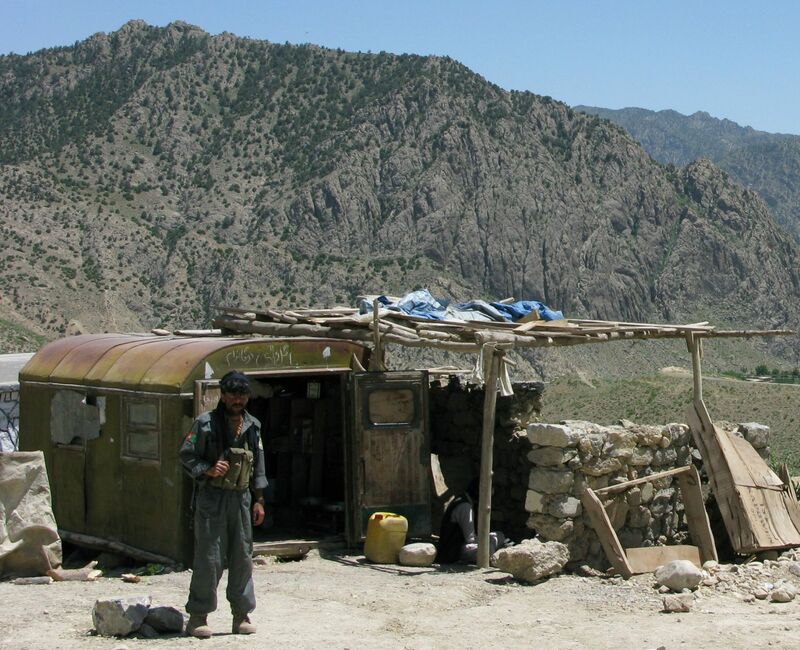 "The Russians brought much more food [than NATO], tea, matches, oil, salt and sugar, and they still couldn't satisfy people and got kicked out," said Mohammad, an interpreter for Norwegian forces in the north-western province of Faryab, near Turkmenistan. "I think it's not possible to catch the heart of the Afghan people." Story by Nick Allen. Edited by Alastair Gill. Videos by Afghan Media Productions, edited by Pavel Gazdyuk. Design and layout by Vsevolod Pulya. © 2014 All Right Reserved. Russia Beyond The Headlines.